Businesswoman asks why couples in business together are punished for being married. A female hi-tech entrepreneur was in Knesset on Sunday to ask why the state of Israel seems to be pushing her to divorce. “The minute I wanted to set up a company, every accountant I spoke to suggested that I divorce, because a law from the times of the British Mandate doesn’t allow couples who set up a company together to give the female partner a salary of more than 4,000 shekels a month,” said Galya Ben-Dor. “This is a fine on marriage,” she said. 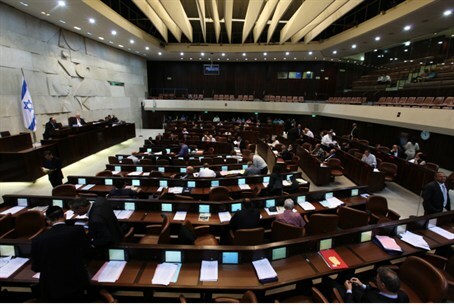 More than 70 MKs have signed a proposed law that would change the current situation. Finance Minister Yair Lapid has stopped the bill’s progress in order to take time to learn about the issue. Lapid previously signed the bill himself. A source in the Finance Ministry said that a change to the current law would mean the state would collect millions of shekels less in taxes each year. MK Moshe Feiglin (Likud), who heads the Knesset Lobby for Strengthening the Family Unit and the Community, expressed his support for Ben-Dor’s speech. “Galya and married couples like her represent the most creative sector, the sector that gives the most to the state,” he said.